A vast literature, led by Max Weber and R. H. Tawney, has grown up on the Connection of Puritanism, Capitalism and the rise of industry. Birmingham, it can be safely said without taking sides in the controversy, was a haven of non-conformity from the first; from its suburbs of Edgbaston and Deritend came one of the first martyrs of the Reformation (Humphrey Middlemore – 1535) and the first martyr of the Counter-Reformation (John Rogers – I555). 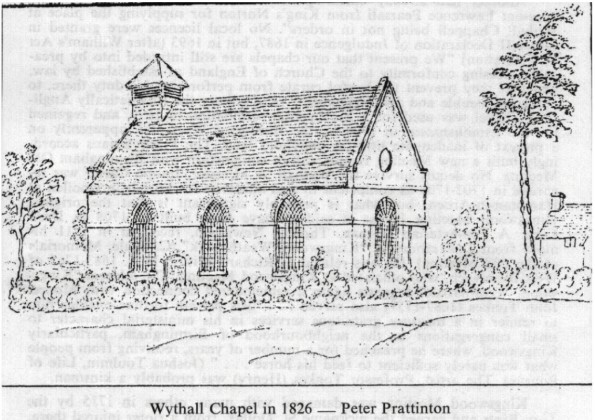 One of the great gaps in the literature of dissent, both Roman Catholic and Puritan, are adequate histories of the smaller chapels-of-ease, which, from their comparative freedom from ecclesiastical control, became centres of non-conformity. Edgbaston, dominated by a Catholic family, was for a time, the headquarters of the Franciscan mission in England, whilst Deritend, Moseley, Wythall and Oldbury became Presbyterian centres. John Hall MA (1600-1653), vicar of Bromsgrove 1624-1653, served Kings Norton himself until 1640. Adjoining King’s Norton Church is the old timber-framed Grammar School to which John Hall appointed his younger brother Thomas in 1629. John’s expulsion was ordered in 1643 on fictitious grounds “of absence” probably his real offence was Puritanism. However, he continued his active ministry until his death. Thomas Hall, born on 22nd July 1610 at St. Andrews, Worcester, where his father was a clothier, took his BA in 1629 from Pembroke College. Oxford. The Grammar School, which he took over at the age of nineteen, was of ancient foundation, but almost unknown until that time. Hall, during his all too brief life, made it famous throughout England. After his death in 1665, it sank into neglect. A flourishing municipal Grammar School now bears the same name, but is not in law the same foundation. Thomas Hall wrote an autobiography (Birmingham, Reference Library, Photostat 467148) as yet unpublished, from which we learn that he was curate-in-charge at Wythall from 1632 – 1635, at Moseley from 1635 – 1640 and King’s Norton from 1640. (In passing, this list provides useful indication of Wythall’s status). All through the earlier period he was presumably living at King’s Norton, where he taught in the week, riding on Sundays to the chapels. Week-day services were rare, even among the Puritans. “Many of his scholars have proved able Ministers of the Gospel” as one of them wrote 1. His main interest was his “Sons” as he liked to call them; a bachelor, he enrolled all the most likely local lads in his school and sent them on to Oxford. At King’s Norton they had the benefit of Hall’s fine private library, bequeathed to the parish at his death and now contained in two large cases in the main reading room at the Birmingham Reference Library. A fine copy of Calvin’s Institutes in Latin sets the tone for a collection sufficiently Catholic to include Torquemadas Questions but with a general Puritan bias. The sermons of most of the Jacobean Puritans arc represented. Hall was a bibliophile in the Cirolier tradition; his binding stamp T.H. is on nearly all the collection. His “sons” returned from Oxford, needed training in the Ministry. Theological colleges in the modern sense did not exist, But Hall built up a circle of Puritan patrons in many parts of England who took his “sons” for a year at a time at their various chapels. Near at hand was Sir Richard Grevis of Moseley Hall and Hall gives a long list of his Chaplains. No such list survives for Wythall, and we do not even know for certain who provided the income. John Field of Weatheroak Hill, gentleman. was presented “for refusing to come to Church”. Henry Field (1611 – 1661), a ‘son” of Hall may in 1664 have been a relative. Unfortunately there were at least three other Field families of gentry in the parish, and Richard Moore, another “son” settled at Weatheroak. It seems probable that the Fields provided the necessary supplement to the miserable few pounds of medieval endowment to support a full-time Curate at Wythall. The only names recovered are in the list at the end, but little information, except in one case, survives about them. Thomas Hall was awarded a B.D. in 1652. no doubt for his two books, The Pulpit Guarded (1651) and The Font Guarded (1652) the former (of which a fine copy is in the writers own library) dedicated to his parishioners at King’s Norton, and the latter, the first book published in Birmingham, is dedicated, appropriately to that city. Together they form a textbook of “high” Presbyterian theology, comparable to the writings of his friend and neighbour, Richard Baxter, in moderate Presbyterianism. The Act of Uniformity 1662 caused his ejection together with one-fifth of the parish clergy of England. He defied the law by refusing to leave the parish and died, it is said, of a broken heart in King’s Norton at 4 p.m. 13th April 1665. Some twenty-four of the ejected ministers settled in or near Birmingham and one of these Richard Moore (1619-1683) is the one Puritan chaplain of Wythall of whom, apart from Hall himself, we have much information. His history is entirely characteristic of the younger ejected Ministers, as is Hall’s of the older. The son of William Moore of Alvechurch; probably a brother of Thomas (1575 – 1655), whose descendants were all staunch Presbyterians. He entered Magdalen College in 1637 and took his BA in 1640. He was rector of Alvechurch in 1650, but was living and preaching at Worcester with Simon Moore, a former curate of Moseley. Richard Moore resigned the living of Alvechurch in 1661 and settled on a property he already owned at the foot of Weatheroak Hill in 1647. Tradition, probably correct, identified this with the present Moor Green Farm. He is said to have preached through a window to crowds standing in the farmyard. The Indian Summer of Presbyterianism ended soon after with another turn at politics and if Moore preached again he kept quiet about it. He was buried at King’s Norton on 27th September, 1683. Another had already taken up his work, however, and the 1682 we “present Lawrence Pearsall from King’s Norton for supplying the place at Withall Chappell being not in orders”. No local licences were granted in James II Declaration of Indulgence in 1687, but in 1693 (after William’s Act of Toleration) “We present that our chapels are still intruded into by preachers refusing “conformity to the Church of England as established by law, and that they prevent the lawful curate from performing his duty there, to our great trouble and discouragement”. At Oldbury the (theoretically Anglican) Chapel was used for a Presbyterian ordination in 1699, and regained for the Establishment in 1708 by the Bishop of Worcester, apparently on a pretext of inadequate title for copyhold land. 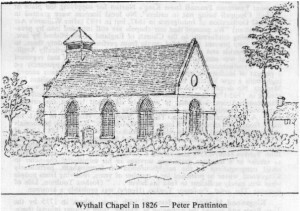 The Presbyterians accordingly built a new Meeting House, run in conjunction with Birmingham Old Meeting (now surviving in the West Bromwich street name). No details survive for Wythall. A Minister, Joseph Carter was regarded in 1702-1706 as competent to sign affidavits for burials in woollen at Hampton-in-Arden, but what is probably significant is that the original Kingswood Meeting House is said to have been built in 1708 in Dark Lane. A Presbyterian layman, Thomas Newnham, recorded in 1711 his move from Tewkesbury to “Kingswood, Weatheroak” 4. He was related to Richard Witton MA (1683-1765) of West Bromwich. who officiated at Kingswood Meeting. The address “Kingswood, Weatheroak” suggests again a remembered connection with Moore. John Tonkes (1687-1757) also served. “His private fortune enables him to render in a measure gratuitous services in his ministerial character to small congregations in the neighbourhood of Birmingham, particularly Kingswood, where he preached for a number of years, receiving from people what was barely sufficient to feed his horse” 5. The artist, Professor Henry Tonkes was probably a kinsman. The first settled minister was David Lewis (1729-1783) and there is a complete succession from then on. The present building is a Victorian reconstruction with much old work remaining; four bricks of 1792 bear names of members of the Grevis family, who at that time, occupied Kilcupps Mill. As the Kilcupps were related to the Fields, history was still running in the old channels.